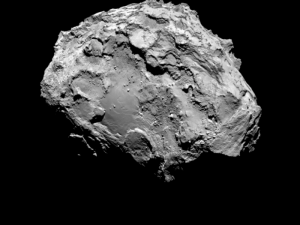 Figure 1: A picture of the comet 67P/C-G, taken by Rosetta in August 2014. The resolution is 5.3 meters/pixel. Image credit: ESA/Rosetta/MPS for OSIRIS Team MPS/UPD/LAM/IAA/SSO/INTA/UPM/DASP/IDA. In August 2014, the Rosetta orbiter met up with the comet known as 67P/Churyumov-Gerasimenko (aka, 67P/C-G). Rosetta stuck close by, watching and observing, as the comet orbited around the Sun. Now, nearly four years later, we’re still learning new science from everything Rosetta (and its lander Philae) discovered. In today’s astrobite, we focus on one comet discovery in particular: molecular oxygen. Molecular oxygen (O2) is certainly important here on Earth. Plants breathe out O2 during photosynthesis, while other living creatures (like humans) breathe it in. But O2 isn’t only produced through life as we know it – which means that if we see molecular oxygen in the atmosphere of, say, an exoplanet, we shouldn’t automatically assume it came from a living source (as talked about in this article and this previous astrobite). 67P/C-G seems like an example of such a non-living, ‘breathing’ body. 67P/C-G is a comet, which means it’s a small icy body of rock, dust, and gas orbiting about the Sun. When a comet passes close to the Sun, the Sun warms up its ices, producing a coma – the iconic ‘tail’ of released gas that trails after a comet during its orbit, as seen in this gallery. With Rosetta, scientists have detected O2 abundance levels in 67P/C-G’s coma of some 1% to 10% with respect to water (which means 1% to 10% of water’s abundance). Scientists have also noted that the rate of O2 production in the coma is surprisingly correlated with the coma’s rate of water production; from this, they’ve concluded that both the O2 and the water must be coming from the same icy phase of the comet. So how did all of this O2 get into 67P/C-G in the first place? To try and answer this question, today’s authors looked back to well before 67P/C-G formed. Back then – waaay back then – the Solar System was young and hip and had yet to form any of its signature planets. This (brief) history of the Solar System starts righteously with a dense cloud of gas and dust, hanging out in space. The dense cloud eventually collapsed, forming a swirling disk of material known as a solar nebula. Gravity dragged more and more material towards the center of the nebula, until the pressure at the nebula’s core was so great that it fused hydrogen into helium – leading to the birth of the Sun. From there, the solar nebula transitioned into a protoplanetary disk, which refers to a puffy disk of dust grains and gas orbiting around a young star. The dust grains in this disk clumped together over time, grew larger and larger, and turned into the asteroids, comets, and planets that we know and love today. These dust grains may have had O2 tucked into their crevices and corners, and when some of these dust grains accumulated to form 67P/C-G, the O2 was trapped inside the comet as it grew. 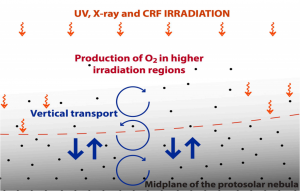 Given O2‘s correlation with water in 67P/C-G, the O2 itself seems to have come from radiolysis of water ice, which is the process where molecules (in this case water) are broken apart by ionizing radiation (like cosmic rays). But 67P/C-G likely formed while the Solar System was still a disk of orbiting dust and gas, specifically along the disk’s midplane where heavier grains would have settled. The outer midplane of the disk would have been a cold, dark, and dense place, far from the young Sun, and ionizing radiation would have had a lot of difficulty even reaching water ice to irradiate it. So how could enough radiation have reached the water ice, in order to produce as much O2 as we see from 67P/C-G? Two mechanisms provide possible answers to this question. One: turbulent mixing in the disk – mixing of the disk’s materials would literally bring dust grains in the midplane up towards the disk surface. And two: the O2 wasn’t produced during the high-density disk phase at all – it was actually produced when the Solar System was still a low-density cloud, when radiation would have penetrated more easily. Today’s authors explored the turbulent mixing idea, and investigated if this mechanism would be enough to produce the O2 observed for 67P/C-G today. Figure 2: A schematic of vertical transport due to turbulent mixing. Grains cycled from the lower midplane towards the upper regions of the disk are more exposed to external radiation. From Figure 1 in the paper. The grains in a solar nebula or protoplanetary disk aren’t all the same size. Larger grains tend to huddle along the midplane because of gravity and drag against the gas. But smaller grains, with less weight to throw around, are more easily tossed and turned about by turbulent flows of the disk gas. This ‘turbulent mixing’ moves smaller grains not only horizontally but also vertically within the disk. Figure 2 gives an illustration of this tossing-and-turning process. Today’s authors pointed out that as grains are churned vertically upwards away from the midplane, they become more exposed to external radiation from ultraviolet, x-ray, and cosmic ray sources. They set out to model this cyclical process over a disk’s lifetime, and see how much O2 relative to water would be produced. To do so, the authors built a simulation of vertical grain transport due to turbulent mixing. To define their disk model’s structure, they artfully combined theory, equations, and parameters from a variety of other papers and studies. For example, they adapted parametric profiles to map out the disk’s horizontal and vertical temperature and density. They used their simulation to track the vertical diffusive motion of the grains in the disk model over time for different grain sizes and levels of turbulence, and from there they calculated how much O2 in their disk model was released due to radiolysis over time. 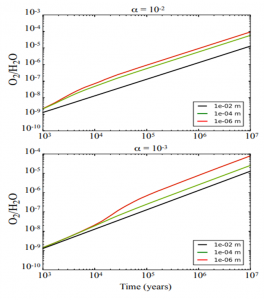 Figure 3: Plots of O2 abundance relative to water over the disk model’s lifetime. Each line corresponds to a different grain size (as given by the legend at the bottom right of each plot). The top panel is for a disk with more turbulence (represented by the α parameter) while the bottom panel is for a disk with less turbulence. From Figure 4 in the paper. Figure 3 shows results from their simulation over 10 million years (scientists think 67P/C-G formed within 2.2 to 7.7 million years). We can see that even the smallest/least heavy, ‘most churnable’ grains didn’t reach the same level of O2 abundance observed around 67P/C-G; even in the closest case, the simulation abundances are still some 2 orders of magnitude below the observations. The authors felt it safe to conclude that turbulent mixing was not a main mechanism for producing the O2 observed in 67P/C-G. So the authors agreed that the evidence points to the second mechanism, which reasoned that the O2 was produced while the Solar System was still a low-density cloud. If this is true, then this affects not only our beliefs for 67P/C-G’s formation, but for the origins and chemistry of the other comets cruising through the Solar System as well. But we’ll need more simulations before we can say for sure!